It appears that French bikers are not the only ones to be angry, British bikers also are, but for a different reason. 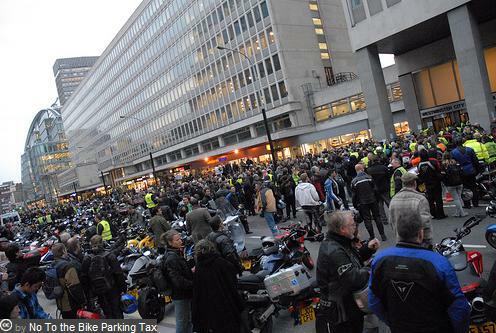 While French bikers demonstrated en masse all over France on 13 March 2010 (more information by clicking here and also here), and are prepared to bring the whole country to a standstill again should the Government stick to their proposals to make filtering through the traffic illegal, British bikers have been protesting at a parking tax imposed on them in Central London with no justification, other than that of filling up the council’s coffers. While the French periodically demonstrate en masse with thousands upon thousands of them going down the streets, the British like to get together every month, in smaller numbers, to constantly keep up the pressure on the public authorities. Different country, different culture, different tactics. But lately, the monthly bikers’ gatherings in London have become more frequent to now take place every Wednesday morning from 7.30 till 9 o’clock, under the name of the “Wednesday Morning Breakfast Club” (WMBC). A few hours before the start of the WMBC, bikers, who previously registered with the No To Bike Parking Tax campaign, receive an SMS to advise them of the location of the meeting point. They meet at 7.30am as instructed on the text message and proceed all together to a key junction or roundabout in order to cause gridlock and enormous traffic jams across the centre of the British capital, during rush hour. After more than 18 months of talking with a council that has completely ignored thousands of bikers’ objections and a series of large demonstrations attended by more than 4,000 people, British motorcyclists have now decided, like their French cousins do, to take radical action by blocking the roads and causing mayhem in London until this unjustified and ridiculous parking tax imposed on them is scrapped. Westminster City Council initially tried to justify the parking charge by promising the installation of devices to securely attach bikes to them to prevent theft. These security devices have never been installed and yet the council is still stealth taxing bikers to park. The council then moved on to say that kerb space in Central London came at a premium, hence the need to charge bikes for parking. Everyone knows, except Councillor Danny Chalkley, the architect of the bike parking tax, that motorcycles don’t take much parking space and are the solution to congestion and pollution issues. So if kerb space was a problem, as Chalkley stupidly suggested, why not discouraging the use of cars in the British capital and encouraging the use of motorbikes and scooters instead, which do not cause congestion and take a mininuscule amount of parking space? Paris have been discouraging the use of cars by scrapping more than 2,500 parking spaces for them, which are to be dedicated to bikes, so why can’t London do this too? Now, Westminster Council (and the same Danny Chalkley) says that motorcycles cause congestion, hence the need to charge them for parking to reduce their numbers in London. “The introduction of motorcycle parking charges (…) is about dealing with the increasing pressures on our roads and ensuring the city does not grind to a standstill”, says Councillor Chalkley. You can see how this guy changes his mind as the wind changes direction. One day the charge is to fund ficticious security devices, another day is because of kerb space management reasons and now, as Chalkley is running out of ideas, we are told that it’s because motorbikes and scooters cause congestion! So the Brits are doing exactly what the French have recently done, that is to prove to the authorities the absurdity of their decision to charge bikes for parking on the grounds that they cause congestion. Westminster Council are treating motorcycles like cars, so they will behave like cars until the parking tax is scrapped. Riders will drive their bike like a car, each taking the space of a car and cause congestion until the council recognises how absurd their latest statement is and scrap the parking tax. This is what’s now happening every Wednesday morning in London – They treat bikes like cars, so they will behave like cars and inconvenience everyone! Enjoy the videos! Fancy joining the Wednesday Morning Breakfast Club? Click here to find out how to join. Bien fait mes pots! Malheureusement je ne peux pas participer le matin parce que je demeure dans la cambrousse. Well done guys ! Sorry I can’t join in but I live out in the sticks & I wouldn’t get there in time. Bravo to both the French and British riders from an American rider. I think it’s a great tactic to use politician’s own stupid laws against them.